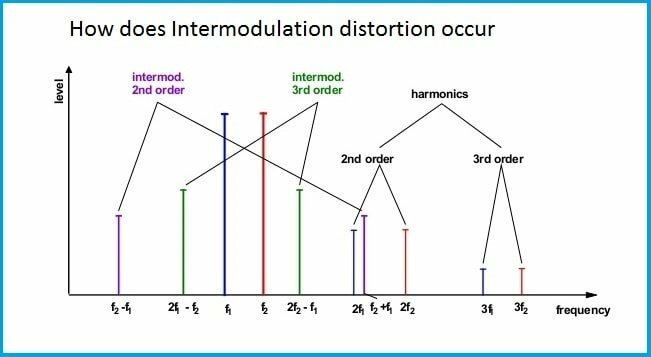 Intermodulation is a phenomenon of combining undesired frequency components within an active system or from an external source. Combination of two or more signals will create another signal which may fall into another frequency band of the system and cause interference to the system. How does intermodulation distortion occur, what are the causes and how to prevent it? In any wireless transmitting system, the efficiency of receiver is very significant and any interference in the received signal could cause interruption of the service. Developers and network engineers make sure the system designed, tested and implemented within the technical specification in order to work efficiently. Since our wireless ecosystem has to support huge number of customers and services, number of transmitting stations and devices increasing exponentially. All these devices exchange information in the form of continuously emitting radio frequency waves. Number of frequency bands also has been increased in this decade after the introduction of 3G and LTE networks. In order to co-exist with other wireless standards, any wireless transmitting system should be within controlled specification of intermodulation distortion. There are mainly two types of intermodulation, passive intermodulation and active intermodulation. Active intermodulation happens in active electronics systems where two or more signals within a system or from external sources combines and create its frequency multiples and products. These signals are usually low power but in some cases it is sufficiently powerful to distort another receiving signal. Any non-liner passive component can cause distortion due to property of the radio frequency waves. RF cables without proper shielding could contribute PIM to the system. Rusty RF connectors, adaptors and exposed signal junctions. Loose contact in connectors, cables and signalling cause intermodulation. Non-liner property of ferromagnetic materials could result in PIM due to magnetic hysteresis effect. Large metal frames and feeder lines could cause some level of PIM. 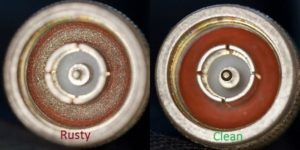 Spark discharges in connector will cause oxidation and thus lead to distortion of signals. Poor contacts in mechanical switches cause PIM. Non-linear active components in any system will produce intermodulation. Microscopic impurities in the semiconductor substrate layer. Multiple signal sources within a system sharing same antenna will lead to intermodulation. For example duplexers used in LTE bands share a common antenna to transmit and receive. Signal lines running closely in circuit boards may lead to crosstalk and intermodulation. Non linear amplifiers are victims of intermodulation distortion due to harmonics distortion and second order intermodulations. In wireless transceivers, harmonics product of one signal source combines with another frequency band of the same transmitter or receiver signal and suffers interference in the receiving band. Mismatch of transmitting antenna handles multiple frequency will cause reflection of signals which mix with other frequency band and results intermodulation. Faulty electronic components and low quality components in the circuits will introduce IMD. Use high quality components and avoid non-linear active components in design of devices. Operate power amplifiers in linear range to avoid intermodulation components. Avoid low quality mechanical switches and poor contact signal adaptors. Use high quality cable assemblies and signal joints. Proper shielding of circuits in transmitting devices can prevent distortion from external sources. Good impedance matching of power amplifiers and antenna will eliminate reflection of signal and improve IMD level. Sturdy connection between cables, directional couplers, power splitters, attenuators, isolators and all components in the system will reduce chances of distortion. Reduce number of components in the system to improve quality. Use all devices and components in the recommended operating range to ensure maximum performance. If possible, keep transmitting antenna and receiving antenna some distance apart. High quality materials in circuit board design will improve distortion. Increased number of wireless transmitting devices for multiples applications contributes to higher level of undesired signal distortion. Higher level of distortion will cause interruption to any wireless communication devices. Modern telecommunication uses wide range of frequency spectrum for wireless transmission which leads to many challenges for network engineers like distortion due to intermodulation and wireless co-existence. In power amplifiers, IMD is one of the significant specifications which qualify an amplifier for a specific uses. In high quality audio systems, causes for intermodulation should be tracked and eliminated for optimum performance. Intermodulation distortion can be controlled up to certain level by improving design, use of high quality components in the system. However, complete elimination of these undesired signal distortion is inevitable in most of the cases due to limitation of components and power amplifiers etc… In order to have an efficient system, engineers have to make sure optimum design, quality components and implementation stages are accurately tested to track any undesired distortion.